February 20, 2015 posted by Len B. A recent investigative report by John Oliver, host of HBO’s hit TV show “Last Week Tonight,” focuses on Philip Morris International’s newest tactic of intimidating both large and small countries through the courts. Their disgusting mission is to eliminate those laws that warn consumers about the dangers of smoking. 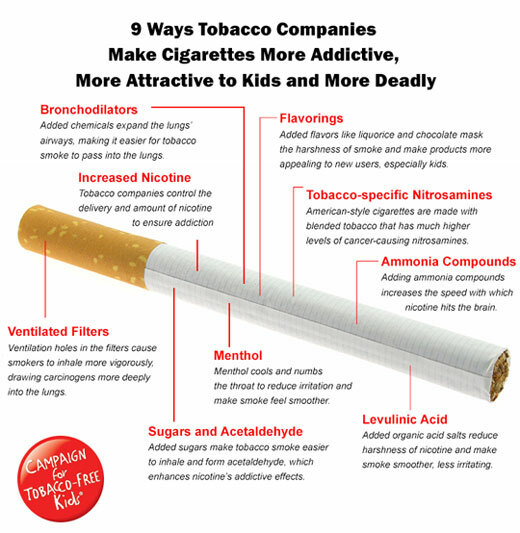 July 30, 2014 posted by Len B.
WASHINGTON, DC – Design changes and chemical additives introduced by tobacco companies in recent decades have made cigarettes more addictive, more attractive to kids and even more deadly, according to a report issued today by the Campaign for Tobacco-Free Kids. The report, entitled “Designed for Addiction,” details how tobacco companies purposely design cigarettes to make tobacco smoke smoother, less harsh and more appealing to new users, especially kids, and to create and sustain addiction to nicotine. Tobacco companies have made these changes without regard for the health impact and actually have increased smokers’ risk of developing lung cancer. The report is being released on the fifth anniversary of the landmark law, signed by President Obama on June 22, 2009, that gave the Food and Drug Administration the power to regulate tobacco products. It calls on the FDA to require tobacco companies, at a minimum, to reverse the harmful changes they have made by issuing the first-ever product standards governing the design and content of tobacco products. Made cigarettes more addictive by controlling and increasing nicotine levels and enhancing the impact of nicotine. Made cigarettes more attractive to kids by adding flavorings such as licorice and chocolate that mask the harshness of the smoke, menthol that makes the smoke feel smoother and other chemicals that expand the lungs’ airways and make it easier to inhale. While the United States has made enormous progress in reducing smoking, tobacco use is still the nation’s number on cause of preventable death. Smoking annually kills 480,000 Americans and costs the nation at least $289 billion in health care bills and economic losses. The Campaign for Tobacco-Free Kids report is based on an extensive review of scientific studies and tobacco industry documents made public as a result of litigation against the industry. It also draws on the conclusions of Surgeon General’s reports and the 2006 Final Opinion of U.S. District Judge Gladys Kessler in her racketeering verdict against the major cigarette manufacturers. Flavorings: Added flavors like licorice and chocolate mask the harshness of the smoke and make tobacco products more appealing to young people (the 2009 tobacco regulation law prohibited cigarettes with “characterizing flavors” other than menthol, but did not prohibit the use of flavorings at levels not considered to be characterizing). Tobacco-Specific Nitrosamines: Levels of tobacco-specific nitrosamines, a potent carcinogen, have increased substantially in American cigarettes in recent decades and are much higher than in cigarettes from Australia and Canada. 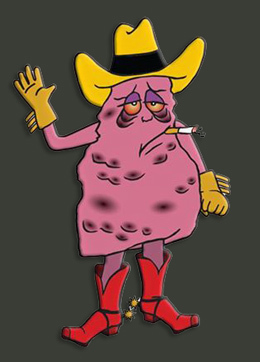 Factors affecting levels of nitrosamines include the tobacco blends and curing process used. March 19, 2014 posted by Len B. Apparently, Philip Morris International is only as responsible as local laws and customs regarding sales of tobacco products to children are concerned. Since Indonesia’s government turns its back on the health and well-being of its citizens, Philip Morris sees a huge opportunity to make billions of dollars while shortening the lives of millions of Indonesians. Where is the world outrage? Historically, the US and other civilized nations have been known to withhold or reduce aid to those countries that fail to treat its citizens equally and civilly – especially when it comes to their children and minorities. So why does the US and others continue to send aid to Indonesia when its government does nothing to protect its children against the greedy claws of conglomerates like Philip Morris? You are currently browsing the archives for the Tobacco Companies category.